I probably won’t be doing Baby Bits much longer… once E walks, he’s a toddler, right? Although “Toddler Bits” doesn’t have the same ring. I’ll have to think of something cooler. Here are some photos from this week. Can you tell which one is E? Here’s one from this morning. He went and got the sash from my bathrobe and put it on like this all by himself! 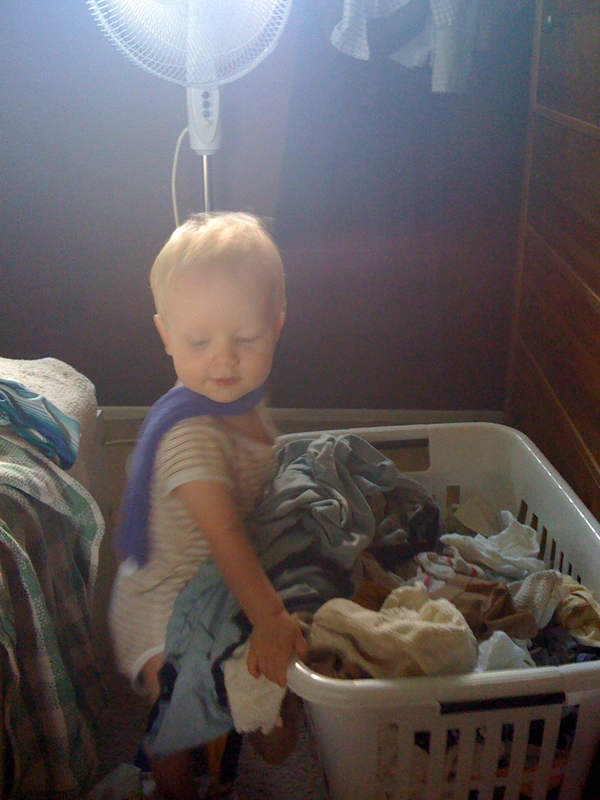 And then proceeded to put a bunch of clean laundry on the floor all by himself. As I watched and laughed and took pictures. How’s that for mothering? 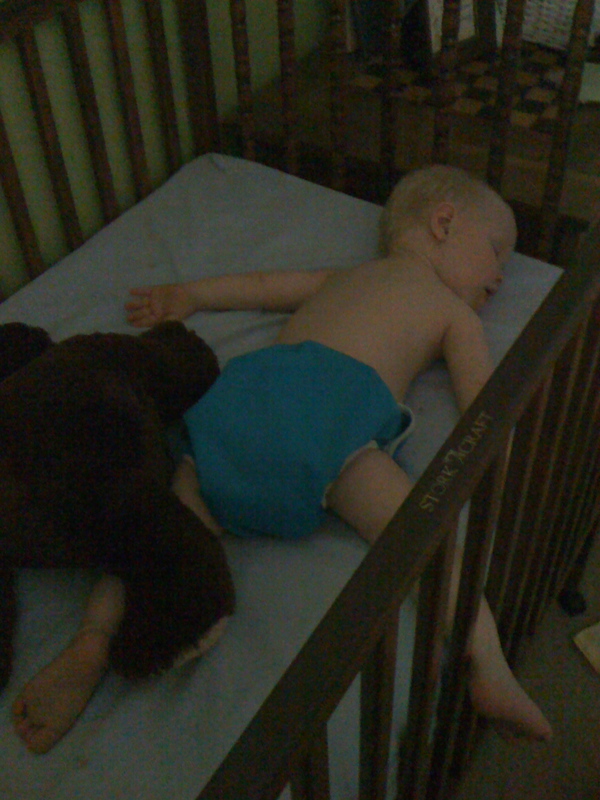 E and his bear were both zonked. E, as I may have mentioned, is resisting naptimes and bedtimes “somewhat”. Today he was decidedly un-calm, despite droopy eyes and yawns, so I just clocked him upside the head. HA! Actually, I simply left him to calm himself. He didn’t even fuss for long, and this was the result. 🙂 Yay! And on that note… it’s time for me to go to bed. Stay tuned for more photos soon! We say, “upside DA head” where I come from. Of course I can tell which one is E! The one who looks like Sean is E and the one who looks like Carson is the other little guy! Good news about the settling himself. Has to happen sometime, and what a relief when it does. Toddler tidbits? Toddler tads? tips? tastes? i LOVE the scarf photos so much. the posing in this one is super great. i watched him take all the clothes out of the dresser last night while he was on the potty and i was on the phone. actually, we were both having conversations. i just don’t know quite what he was saying to the clothes. so many great events today! besides sleeping in the crib, there was going downstairs by himself! learning to use a straw! eating carrots on the kitchen floor! watching cars! and so much flirting!!! wow, that’s true, L does look like Carson. Last time it was Ben. Next time it’ll be… Luc?